Just Say No is Not Always Enough! When “Just Say No” is not enough. I have a book on my nightstand written by Betsy Brown Braun, “Just Tell Me What to Say”. It is a guide book of answers to our kids’ questions. This morning, I read this great post by a mom, who wrote about how teenagers may need a guide with the same title. Our teens are in dire need of our assistance in forming the words to respond to their peers, who have already or are inevitably going to introduce them to drugs and alcohol along with other “bad” behaviors. Let’s help them develop a script of answers and sayings when they want to “Just say NO” with an explanation that saves their friendships and perhaps even dissuades their friends from making “bad” choices. When you notice a lonely kid: Hey! Here’s a seat for you. Come join us. When someone starts texting while driving: Hey, I just saw a movie about a kid who got killed because he was texting and driving. I don’t want you to get killed because I plan to ask you for many, many rides in the future. Pull over if you need to text — I’m not in a hurry. You find yourself in a sexual situation you’d prefer not to be in: Hey, I like you too much for this to go down this way. A kid is being teased by another kid in the hallway: Hey. I don’t want anybody to get in trouble here. Why don’t you follow me out of here? I’ll walk you to class. Someone is about to drink and drive: Don’t risk it, man. My dad’ll get us home — no questions asked. He’d rather pick us up here than in jail. I don’t know if my ‘tween will use these life preservers we made together. But when that moment comes he will know that they’re available if he wants to save himself. And when he leaves the house in the evening and I say to him, just like when he was two, Use your words tonight — I know he’ll have words to use. via The One Conversation That Could Save Your Teen’s Life (And Your Own) | Glennon Melton. Thank you to Glennon Melton for this insightful article about how to “Just Say No” in a way that will not cost a teenager too much angst. We all know, saying “NO” is only part of the conversation. Let’s move forward as parents and grandparents and give out kids the words and explanations to go along with the “Just Say No” advice. It could make a huge difference in how they travel through the challenging world of adolescence. Teenagers and Alcohol is a post I wrote a while back but it seems appropriate to share it again after what I read and saw on today’s television news. via North Andover High Punishes Teen For Giving Drunken Pal Ride Home From Party « CBS Boston. Today in the news a teenage athlete answered a call from her girlfriend, who asked her to pick her up from a party because she was drunk and needed a ride home. For this gesture the young athlete was punished by her school stating that she had violated the school’s “zero tolerance” policy. I have many opinions about drinking teens. I am not in favor of alcohol at parties and underage drinking but I am also not in favor of zero tolerance policies that are misguided and enforced in such a way that they penalize a student for helping her friend get home safely. Let’s try and teach something here…use this as a chance to address the very serious problem of underage alcohol abuse in high school and college. It is not all about punishment, it is about education and the responsibility of parents, and schools to make kids aware of the consequences of drinking, drinking to excess and of course driving while drunk. It is about teaching them to engage parents when faced with caring for friends who are drunk rather than bearing all the burden themselves. “Parents teach their children how to swim, how to ride a bicycle and how to drive. Should they also teach their teenagers how to drink responsibly? The volatile issue is seldom discussed at alcohol-awareness programs. But some parents do quietly allow their teens to have wine or beer at home occasionally, figuring that kids who drink in moderation with their family may be less likely to binge on their own. Research also suggests that alcohol can do long-term harm to developing brains. In the late teens and early 20s, the brain is developing its adult shape, pruning away unused connections and forming permanent pathways, particularly in areas involved in planning, decision-making and impulse control. Brain scans have shown that heavy drinking—20 drinks or more a month—in adolescents can create changes in the frontal cortex, the hippocampus and white matter, leading to decreased cognitive function, executive function, memory, attention and spatial skills, researchers at the University of California-San Diego wrote in the Journal of Clinical EEG and Neuroscience in 2009. 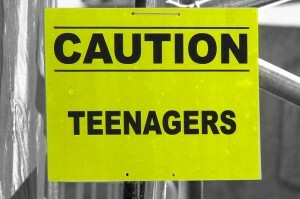 Teenage drinking…what do you think is the role of parents in educating their teenagers about alcohol use ? This issue was one that I faced a few years back and I chose to be very proactive in alcohol use education. that alcohol was in the high school world as were drugs. there were parents who were allowing parties at their homes and were taking away the keys so that kids could not leave and drive. my thoughts about this were pretty plain and simple … they were acting irresponsibly and encouraging alcohol abuse. The high schools at the time were asking athletes to sign a pledge stating that they would not engage in alcohol use and drugs while they were playing competitive sports. However, there was no way to enforce this requirement as there was no drug testing…the kids and parents knew this so the pledge was essentially worthless. I was only aware of one high school in our sports conference whose football team players were randomly drug screened. This screening program was paid for by a private sponsor so it was not coming out of the pockets of local taxpayers. It was featured in Newsweek at the time and was considered controversial. At least there was some “teeth” in the pledge and athletes were held accountable. The program was not a punitive one…students were offered counseling if they tested positive for illegal substance. So what was my approach to teenage alcohol? Well, I knew first hand about alcoholism and the havoc that it plays on families…one of my maternal uncles suffered from this disease. He was a “father figure” in my family and had stopped drinking after retirement. He spoke freely about his problems with alcohol. I decided it was time for field trip to the local liquor store with my teenagers . What we found was very enlightening. There of course was the beer that most teenagers drink but then there was an entire aisle devoted to “teenage tastes“. In that aisle we found, wine coolers, pre-mixed drinks, mudslides, lemon drops…all the sweet tasting beverages which seem to satisfy the teenage “sweet tooth” along with their desire to experiment with alcohol. I told my kids that they would probably have to make choices about alcohol use. I told them that they should feel comfortable asking me questions at any time. I told them I would answer their questions and then give them my opinion. I told them if they ever found themselves in a “situation” while they were out that they could call me or their dad and we would pick them up no questions asked. I told them we would discuss the “situation” the next day when we were all rested. I told them that I wanted them to promise to “NEVER DRINK AND DRIVE” or allow anyone to drive them who had been drinking this included parents. I warned them of driving home from babysitting jobs with a parent that had been drinking. teenage drinking is a problem that is not going away. This could make a “life and death” difference.